Akos Revesz, a PhD researcher in Sustainable Energy at London South Bank University (LSBU), has won second place in the People category of a national science photography competition, organised by the Engineering and Physical Sciences Research Council (EPSRC). The competition promotes the importance of science research to the general public. Titled ‘Tunnelling into London’s Past’ (above), Akos’s photograph depicts researchers approaching the platform level of a disused London Underground station, which is approximately 27 metres below the ground. 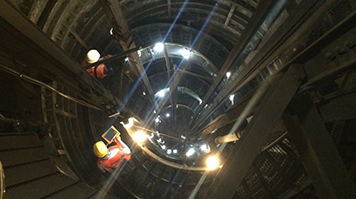 Akos took the photo using an iPhone 5S while working on a London Underground, EPSRC and LSBU supported research project. The key objective of the project is to investigate the potential for utilising heat accumulated in the surroundings of the London Underground tunnels for low carbon heating. “It is crucial to promote greater understanding of science and engineering research, the role it plays in making new discoveries, developing new technologies and in making the world a better place for us all. These are truly inspirational images and tell great stories,” said Professor Robert Winston, one of the competition judges. “I am grateful to my supervisors and London Underground for this exciting research opportunity. It is a privilege to work in an inspiring environment with LSBU’s Centre for Air-conditioning and Refrigeration Research (CARR) team,” said Akos. Find out more about LSBU’s School of The Built Environment and Architecture.